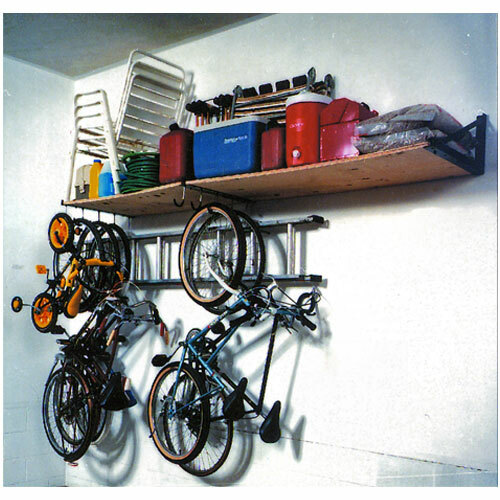 Our TidyGarage One Level, Side by Side, Garage Shelving System is completely customizable, and modular in design. Adjust your shelf depth from 12 to 24 inches. Width of shelving can be as wide as (8) eight feet. Install to any load bearing wall – wood or cement. Sturdy steel construction ensures strength even under the heaviest loads. Brackets and shelving angle are white powder coated, for a durable corrosion proof finish and can support a load of up to 300 pounds. 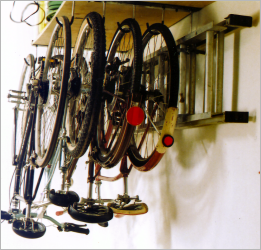 Comes with (2) two packages of (4) four vinyl coated, multi-purpose hooks, that attach to the brackets, to prevent scratching of bicycle rims and other objects that can be hung beneath shelving. 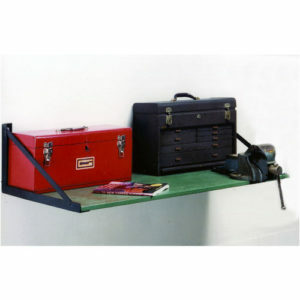 Ladder hooks can be mounted underneath the shelf, to neatly store your ladder close to the wall, keeping it out of the way and reachable when you need it. 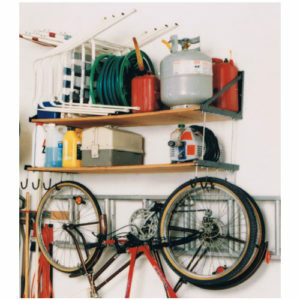 Add our wire mesh shelf to your one-level garage shelving system, and you can increase the storage capacity even more, and move items such as balls, gloves, skates and helmets, off the floor and out of the way. Shelf Mounting Bracket(s) must be installed on a load-bearing wall in your garage ( or an area of your choosing ). Failure to install the bracket(s) on a wall capable of supporting the weight of the bracket ( 300 pounds ), may result in significant damage to wall structures. Please take care in this regard. 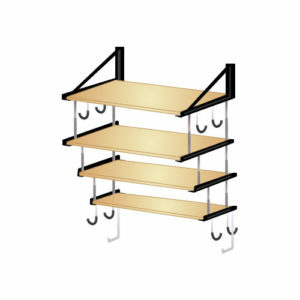 Multi-purpose hooks can be attached to the shelving bracket, or the shelving angles ( if your shelving unit becomes more than just one shelf ), to add additional storage capacity. Ladder hooks can be installed at the bottom of your shelves, to safely and securely, store you ladder next to the wall, and out of the way. 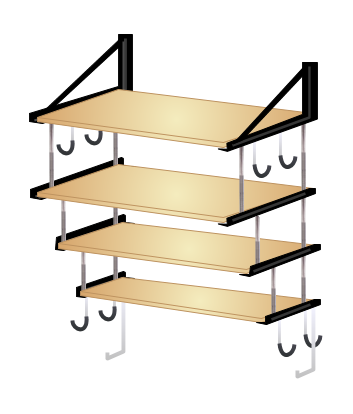 With the brackets able to hold a maximum load of up to 300 pounds, you can easily adjust the shelving width anywhere from (4) four feet up to (8) eight feet.